Show your support for County businesses and get your loved ones great gifts at the same time. Buying gifts from local shops supports our County economy, while also helping to reduce carbon emissions caused by shipping gifts or driving to stores that are further away from home. Local proprietors often spend countless hours sifting through competing goods to find products that are most appealing to their customers. Though a single local shop likely stocks a smaller selection than can be found online or at large chains, multiple independent retailers creates great diversity. When thousands of shops serve the preferences of their customers’ tastes, the local gift giving experience becomes unique. When you are shopping this holiday season please consider local options to give exceptional gifts and supporting the sustainability of the local economy. Want to give local gifts? Let us count the ways! Montgomery County is home to a growing, value-added, food manufacturing economy. In 2016, the County had 61 food manufacturer businesses. That’s a lot of delicious edible treats produced locally. During this holiday season, help to support local food manufactures by shopping for the foodie in your life and on your list. You can buy edible gifts with the MoCoMade logo to ensure your support of local farmers and producers. The Montgomery County Food and Beverage Guide from the Montgomery County Food Council is chock-filled with ideas. 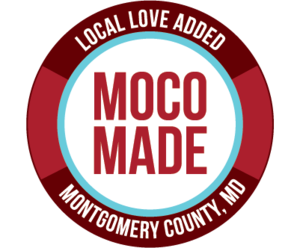 When you shop, look for the MoCo Made sticker which designates locally-produced foods and other products. Perhaps food isn’t really your thing. Our partners at the Montgomery County Chamber of Commerce not only support local business, but can serve as a valuable resource for finding homegrown shops that carry the goods or services you are looking for. The Gift Outside the Box campaign of the Montgomery County Dept. of Environmental Protection is off and running. Find cool ways to gift differently this year. Give an experience, gift greener, buy local and give back to the community.